Kaylia Arrigoni and Wayne Belcher (front) with community volunteers helping to pack Christmas boxes for children. More than 100 volunteers and community members packed thousands of items into 768 shoeboxes destined for children in South-East Asia. 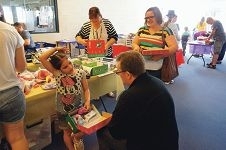 The annual Big Box Fill Day at Lake Joondalup Baptist Church was the end to a year of collecting stock to fill the boxes. The boxes will be sent to children around the world experiencing war, natural disaster, poverty, illness or neglect. The yearly church event has grown from 39 shoeboxes in 2009, 500 in 2013 and a new record set this year. Operation Christmas Child, co-ordinated by international aid organisation Samaritan’s Purse, is the largest children’s’ charity in the world. Last year 10 million shoeboxes filled with new items of clothing, toiletries, toys and stationery, brought joy to children in more than 100 countries around the world. WA hopes to reach a target of 40,000 boxes this year.